“To kick off the new year, we’d like to share with you data on your blog’s activity in 2014. Start scrolling! The Louvre Museum has 8.5 million visitors per year. This blog was viewed about 430,000times in 2014. If it were an exhibit at the Louvre Museum, it would take about 18 days for that many people to see it. There were 419 pictures uploaded, taking up a total of 163 MB. That’s about a picture per day. The busiest day of the year was July 13th with 183,181 views. 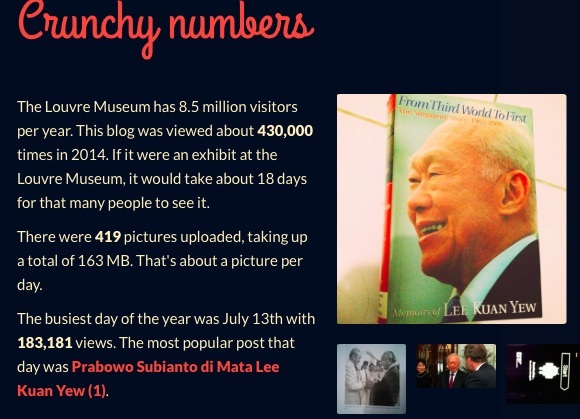 The most popular post that day was Prabowo Subianto di Mata Lee Kuan Yew (1). In 2014, there were 429 new posts, growing the total archive of this blog to 1,304 posts. Some of your most popular posts were written before 2014. Your writing has staying power! Consider writing about those topics again. That’s 141 countries in all! Most visitors came from Indonesia. Singapore & The United States were not far behind. This entry was posted in blogging and tagged blog, Lee Kuan Yew by akhlis. Bookmark the permalink.